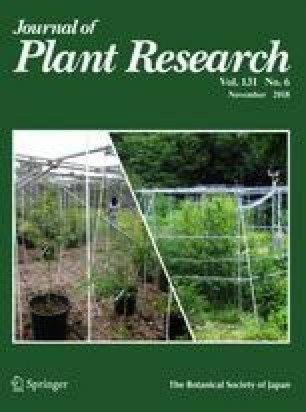 Salt tolerance mechanisms were studied in three Irano-Turanian halophytic species from the Brassicaceae ‎‎(Lepidium latifolium, L. perfoliatum and Schrenkiella parvula) and compared with the glycophyte Arabidopsis thaliana. According to seed germination under salt stress, L. perfoliatum was the most tolerant species, while L. latifolium and S. parvula were rather susceptible. Contrastingly, based on biomass production L. perfoliatum was more salt sensitive than the other two species. In S. parvula biomass was increased up to 2.8-fold by 100 mM NaCl; no significant growth reduction was observed even when exposed to 400 mM NaCl. Stable activities of antioxidative defense enzymes, nil or negligible accumulation of superoxide anion and hydrogen peroxide, as well as stable membrane integrity in the three halophytes revealed that no oxidative stress occurred in these tolerant species under salt stress. Proline levels increased in response to salt treatment. However, it contributed only by 0.3‒2.0% to the total osmolyte concentration in the three halophytes (at 400 mM NaCl) and even less (0.04%) in the glycophyte, A. thaliana (at 100 mM NaCl). Soluble sugars in all three halophytes and free amino acids pool in S. parvula decreased under salt treatment in contrast to the glycophyte, A. thaliana. The contribution of organic osmolytes to the total osmolyte pool increased by salt treatment in the roots, while decreased in halophyte and glycophyte, A. thaliana leaves. Interestingly, this reduction was compensated by a higher relative contribution of K in the leaves of the halophytes, but of Na in A. thaliana. Taken together, biomass data and biochemical indicators show that S. parvula is more salt tolerant than the two Lepidium species. Our data indicate that L. latifolium, as a perennial halophyte with a large biomass, is highly suitable for both restoration of saline habitats and saline agriculture. The online version of this article ( https://doi.org/10.1007/s10265-018-1053-6) contains supplementary material, which is available to authorized users. R.H. and S. B.-R. thank Research Deputy Office, University of Tabriz, Iran for providing a postdoctoral fellowship for S. B.-R. This work has been supported by the Center for International Scientific Studies & Collaboration (CISSC), Iran. C.P. thanks support from project SAL-CAL-MED from Spanish MICINN BFU2016-75176-R.